As one of the first Hokas to come on the market, the Stinson has long been a fan favorite. 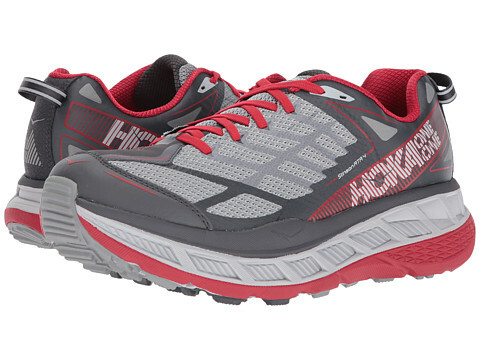 With plenty of cushioning and support, this is a fantastic shoe for a wide variety of runners. It is the first shoe that I ran in when I was returning from a back surgery, the extreme stack height and supportive active foot frame simply makes running a little easier. The Stinson ATR 4 ha a completely revamped design with the most trail specific features of any Stinson model to date. With an updated fit, added traction, and increased durability, the Stinson ATR 4 looks to be a solid choice for the runner seeking a maximally cushioned trail running shoe. In order to help the Stinson ATR perform better on more technical terrain, version 4 now features a new outsole design with more substantial lugs. Previously utilizing small non aggressive lugs, the shoe now offers an outsole covered with large, sticky lugs to increase traction and durability. The shoe still retains a maximally cushioned experience but this version has a slightly lowered stack height and heel toe offset. This should make the shoe a bit more nimble on more technical terrain, it also means that it is a little lighter. A newly designed upper is composed of a forgiving mesh with welded overlays. This new upper, combined with a wider last, should allow for significantly more room in the forefoot. Not only should this enhance the on foot experience but it should also increase the shoe’s overall durability. Many of our customers had issues with the width of the Stinson 3, this problem looks to have completely remedied in the 4th iteration. We think that this version is definitely a huge improvement on Stinson 3, come on in and give it a try!